Spring has arrived in metro Atlanta! Get out and support your local raqs community with some great shows and workshops coming up in April, including visits from two leading tribal fusion artists. "A Night in the Oasis: Glam Oasis"
Mina brings us another Oasis event, featuring a diverse lineup of local talent in a coffee house setting in the middle of Oakhurst. Visit the Facebook event for more details. 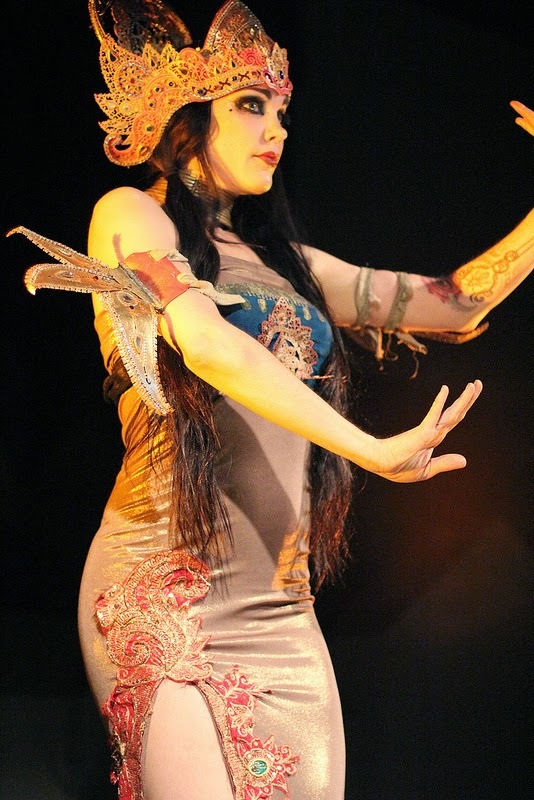 Workshops Friday 6:00 - 9:00 p.m. and Saturday 2:00 5:00 p.m.
Atlanta Fusion Belly Dance presents six hours of study with New York City-based fusion artist Sera Solstice. RSVP to the Facebook event for more details, or click here to buy passes. Friday 6:00 - 9:00 p.m.: Glitch-Heart-Seeker. In this workshop, dancers build awareness of body-lines and shapes through learning a choreography. Composed of sculptural forms, pops and locks, tension and release, this challenging choreo calls the dancer to be present and calm, building stage-presence and breath-work into each movement. Saturday 2:00 - 5:00 p.m.: Travel Moves. Expand performance by using your space. Sera shares techniques for graceful travel, and various creative ways to move across a stage using bellydance-inspired movement. Travel combinations draw from Sera's Lunar and Solar Movement vocabulary, with focus of footwork technique, turns, and multi-layered bellydance movements. Join Faaridah for a new choreography fusing Bollywood, belly dance, hip-hop, and Bhangra to a mash up of Bollywood hits including the hit from the Hindi movie "Student of the Year," "Radha!" This class is open to all levels, and the choreography will be performed in AFBD's 6th Anniversary Show on June 14. Learn to make your own pantaloons with Ziah, an experienced costumer and seamstress! Bring your sewing machine if you have one; if not, machines will be available. Visit the Facebook event for more details, materials list, and to pre-register. Master fusion artist Zoe Jakes has developed a format all her own called DanceCraft. Get an introduction to Zoe's format with two full days of dance, presented by Ziah of Awalim Dance Facebook event for more info. Zoe Jakes and Beats Antique perform on the main stage at 6:30 Friday night as part of this annual music festival at Centennial Olympic Park in downtown Atlanta. They'll be followed by Thievery Corporation and Snoop Dogg. Click here for more info and tickets. Celebrate GLOW's first anniversary with a hafla featuring GLOW instructors and students, plus lots of local dancers. RSVP to the Facebook event for all the latest news. Click here to get your tickets -- just $5! Learn a brand new sword choreography by Schadia. Music will be provided to participants. Bring your own sword, or rent ($5) or purchase ($15) a student sword; professional swords available for purchase as well. Click here to pre-register. Learn a choreography to be performed by interested students at AFBD’s 6th Anniversary Show on June 14. Click here for advance passes.